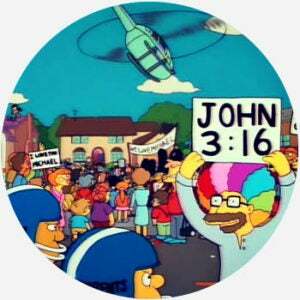 John 3:16 is a widely quoted Bible verse that summarizes the cornerstone Christian belief that their God sacrificed his son for the salvation of humanity. It's associated with signs that fans often bring to sports games. When it comes to religion or politics, some might argue, it’s easy. John 3:16, take it or leave it. Where does John 3:16 come from? 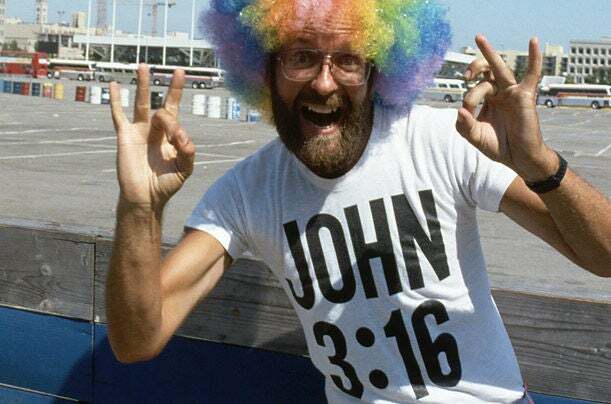 One notable “sports evangelist” was Rollen Stewart, nickamed Rainbow Man for his rainbow-colored wig, which he wore along with a John 3:16 t-shirt while dancing around goal posts—where the TV cameras put eyes on his message. Another was quarterback Tim Tebow, who wore John 3:16 eye black in a 2009 college championship game and coincidentally threw 316 yards with the paint under his eyes in a 2012 NFL game.